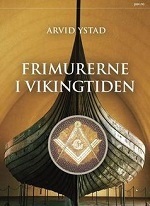 “Freemasonry In Viking Times” is a book written by the Norwegian Freemason Arvid Ystad, a civil engineer and layman historian. He chose a subject that you may have run into more often on this website: origins of Masonic symbolism that can be found in prechristian Northern Europe. The book is written in Norwegian. I have not found a place to get it outside Norway and the publisher (where I ordered it) has no plans for an edition in another language. So I read the book in Norwegian and I wrote an article based on it from this exercise. You can find that article here. Of course I do not master the language so I am not the right person to judge the book, but what I understand from it there are a few, somewhat thin, red threads, but also a wealth of interesting similarities, several of which were new to me. I certainly hope the book will raise some attention and that the author will make an English version of it, so I (and other people) can get more to the bottom of Ystad’s information. The book has some pretty detailed descriptions Masonic ritual and symbolism of “blue Freemasonry” as the author calls it (the first three degrees of Entered Apprentice, Fellowcraft and Master Mason), so I may need to discourage reading the book to people who plan on joining a lodge, or who have not passed the three mentioned degrees. The author does mostly refer to the York Rite and probably based his information on some old work(s) of exposure, but in some situations the information just might be a bit too detailed. Extra points for being one of the few to write about this subject and for the fact that I ran into things new. To get a better idea of the book, read my article about it.